Geneva – IOM, the UN Migration Agency, reports that 10,243 migrants and refugees have entered Europe by sea through the first two months of 2018, with just over 50 per cent arriving in Italy and the remainder divided almost evenly between Greece and Spain. This compares with 17,438 arrivals across the region through the same period last year. At this time in February 2016 there already were 116,005 arrivals – roughly 100,000 more than at this point this year and last. IOM Libya’s Christine Petré reported Thursday, that IOM has assisted 3,730 vulnerable migrants to return to 26 countries from Libya this year. This week IOM’s Voluntary Humanitarian Return Assistance program supervised three flights – two charters and one commercial – allowed 315 migrants to return to the countries of Mali, Benin and Niger. IOM’s Olivia Headon added that late Wednesday 102 migrants – reportedly including Moroccans, Algerians, Somalis and Eritreans – were returned to shore in Zwara by Libyan Coast Guard. The group included one child, seven women and 94 men. IOM's health team provided emergency medical assistance, including for chemical burns and scabies. IOM Athens’ Kelly Namia on Thursday said that over three days ending 27 February the Hellenic Coast Guard reported at least two incidents requiring search and rescue operation off the islands of Lesbos and Samos. The Coast Guard rescued 83 migrants and transferred them to these islands. Those rescued, plus another 34 arriving on Kos and Leros brings the total number of sea arrivals to Greek territory through 27 February to 2,653 (see chart below) – an average of 45 persons per day. 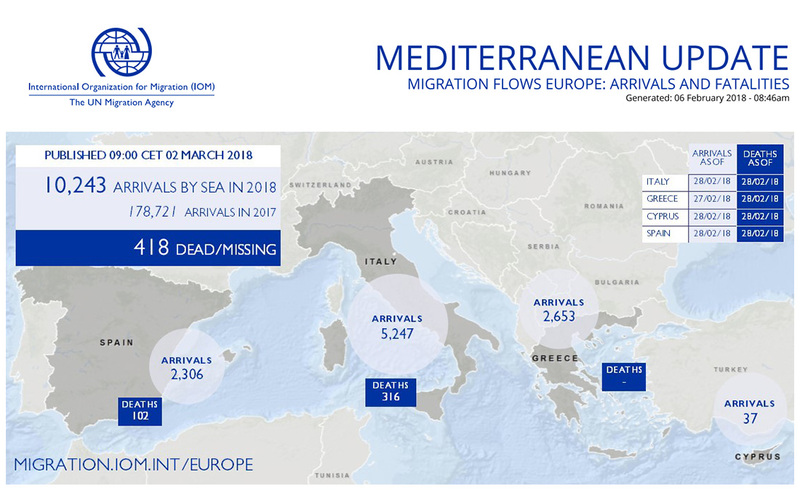 IOM Spain’s Ana Dodevska reported that total arrivals by sea in 2018 have reached 2,306 men, women and children who have been rescued in Western Mediterranean waters through 1 March (see charts below). IOM Rome’s Flavio Di Giacomo said Monday that, according to Ministry of Interior figures, 5,247 migrants have arrived by sea to Italy this year: or fewer than half the figure at this time last year, when 13,446 migrant men, women and children were brought to Italy after being rescued in the waters north of Africa. This two-month total is the lowest IOM has reported since 2014 (see chart below). Through two months on the Mediterranean, 418 migrants are estimated to have died in 2018, compared with 485 at this time last year. Most recently, four deaths were recorded on the Western Mediterranean route between North Africa and Spain – which brings to 102 the number on that route, more than twice the total at this time in 2017, when IOM recorded 41 fatalities on the Western Mediterranean route. IOM’s Missing Migrants Project (MMP) on 21 February recorded that the remains of a man and a woman were recovered 25 nautical miles north of the Béni-Saf beach in Ain Témouchent, Algeria. The remains of one young man were retrieved in La Línea de la Concepción near Cádiz, Spain, on 25 February, and on 26 February, five migrants were rescued from a boat off Cádiz by the Spanish maritime rescue agency Salvamento Marítimo. Tragically one of those rescued died of cardiac arrest upon arriving at the Port of Tarifa. Worldwide, IOM’s Missing Migrants Project has recorded 666 migrant fatalities in 2018, compared with 963 at this time last year. Besides those lost on the Mediterranean, MMP noted that on the Iraq-Turkey border, six migrants died from the cold weather as they tried to cross into Turkey from the Kurdistan Region through the Mergasur river on 27 February. Five of them, four children and a woman, died on the Iraqi side of the border, while one body was retrieved by Turkish authorities. Three migrants lost their lives on the US-Mexico border: on 27 February, three migrants drowned when attempting to cross the Río Bravo near Piedras Negras in Coahuila, Mexico. In South America, two stowaway teens fell from a New York-bound plane leaving Ecuador on 26 February. The two boys, aged 16 and 17, were cousins from a province outside Guayaquil. They hid in the plane’s landing gear and likely fell during take-off, according to local authorities. MMP data are compiled by IOM staff but come from a variety of sources, some of which are unofficial. To learn more about how data on missing migrants are collected, click here.